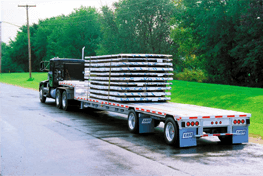 A step deck, or "drop deck" trailer resembles a standard flatbed model with a single drop in order to give the trailer the capacity for more cargo height. 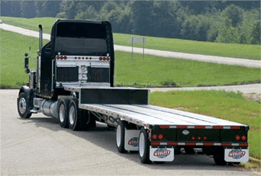 This is especially advantageous when the payload exceeds the standard height requirements for a regular flatbed. This is especially advantageous when the payload exceeds the standard height requirements for a regular flatbed. For especially large or oddly sized pieces of equipment, the step deck trailers present a uniquely ideal solution; tractors, farming combines and large construction and industrial equipment. What Is a Step Deck Trailer Used For? Step decks are useful for when cargo is not of an excessive size or dimension, but exceeds the maximum height allowed by a standard flatbed trailer. Tractor Transport uses a variety of step decks taller tractor and equipment models that don't exceed standard weight. Our team of expert customer service professionals will listen to every detail of your job, and start an order with all of our conveniences available to you; no cancellation fees, shipping route expertise, convenient, fixed prices and door-to-door shipping service. When you ship your tractor or other high-value equipment with Tractor Transport, your precious cargo is in capable hands. 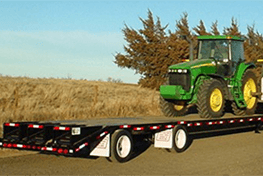 How Does Tractor Transport Handle Shipping With Our Step Deck Trailers? When you have a tractor or other piece of equipment that doesn't fit a standard shipping trailer, like a regular flatbed model. 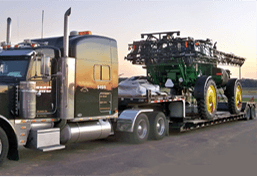 When the cargo is too large or otherwise can't be carried in standard shipping methods, allow Tractor Transport to provide effective solutions to every logistical issue you might come across.